Watch your hummingbirds for half an hour a week, anytime between dawn - 9:00AM. While you're watching and enjoying the hummingbirds, please fill out what species you see in your yard, using the Abundance form. Collecting abundance data is an essential part of the project. 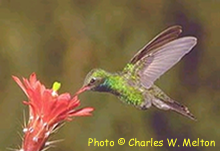 Optionally, you may also report information on the behavior of the hummingbirds. If you chose to collect behavioral data, use the Behavior & Abundance form instead of the above form. This will be extremely valuable in understanding the abundance data and species interactions taking place among hummingbirds. Feeding: A bird is feeding from a feeder, or flower, with a few second break between feeding bouts. If you report the bird is feeding, please add the feeder / plant information in the next two columns. Perching: sitting on a branch / feeder and such, in an erect posture, usually after feeding. Scout flight and/or Insect feeding: Bird flies to a point in the vicinity of the feeding place, then it hovers for a few seconds in place, then flies to a second point and hovers, and so forth. The bird may be feeding on insects in the air (although they may be too small for youto see them). Display flight: flight includes climbs and dives (up to ~40 meters high) above the display object (another hummingbird / other bird species/ predator / human). 5-10 dive displays may be given in a sequence. Flight may or may not include vocalization. Chasing: A hummingbird pursues another individual and chases it out of the area. This pursuit usually occurs by a displayer. If you report the bird is chasing or displaying, please add in the next two columns information about the species that is being chased, or the target of the display (if known). Once you have collected the data, please report it through this web site. Please enter your data on a weekly basis. This will enable us to follow changes in hummingbird' responses as they occur. It will also prevent large amounts of data accumulating and hours of work in a later stage. Please save all your data sheets and send them to us* at the end of the project as a backup.